As a dealer for Logan Graphics, we carry the complete line of Foamwerks tools, a complete line of tools designed to cut, model and build with foamboard. FoamWerks tools are accurate, easy to use, and able to cut circles, straight edges, beveled edges, v-grooves, small holes and rabbet edges. Perfect for architectural and room models, craft projects, home decor, holiday and school projects. All feature quick-change blades and ergonomic designs. Once you have your tools, Logan has a bunch of projects you can try out. Check out the bottom of this page to see them. Cut perfect straight edges on any depth of foamboard from 1/8″ to 1/2″. FoamWerks Straight Cutter features adjustable blade depth, quick change blade clip, magnetic blade slot, on-board blade storage drawer and five blades. Use with FoamWerks Channel Rail, Logan Adapt-A-Rule or Team System. Use replacement blades WC-5, WC-20 or WC-50. Economy and versatility combine in the FoamWerks Foamboard Straight/Bevel Cutter. Simply rotate the angled base block and Model WC-6010 transforms from a straight cutter to a bevel cutter. Features include adjustable blade depth, ergonomic handle and on-board blade storage. The Straight/Bevel Cutter works with 3/16″ foam board. The Straight/Bevel Cutter includes two blades and can be used with any suitable straight edge. Use replacement bladesWC-5, WC-20 or WC-50. Create perfect adjoining foamboard joints with FoamWerks Foamboard Rabbet Cutter. The innovative ergonomic construction and dual blade action create one-stroke finished results. WC-4010 also features on-board blade storage and includes two blades. Use as either a right-handed push style or left-handed pull style action. The Rabbet Cutter works with 3/16″ foam board. Use replacement blades WC-5, WC-20 or WC-50. Cut perfect circles from 1″ to 6″ diameters. Center depth indicator shows blade progression for board depths from 1/8″ to 1/2″. Features dual inch/metric rail, centering pin, magnetic blade slot and clear acrylic safety dome. The circle cutter includes five blades. Use replacement blades WA-5 or WA-20. Cut freeform shapes with this innovative push-style cutter. Easy to use, just insert the blade into the board and push to follow the desired shape. Features ergonomic handle, on-board blade storage compartment, blade safety shield and two blades. The Freestyle Cutter works with 3/16″ foam board. Use replacement blades WB-5 or WB-20. Drill perfect holes in foamboard using one of three interchangeable quick-change drill tips included. Choose 3/4″, 1/2″ and 0.28″ diameters. The Hole Drill WD-8011 works with 3/16″ foamboard. 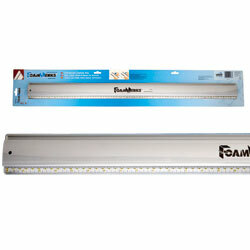 Aluminum 32″ rail features channel rail on one side and dual scale on the other. Channel rail is compatible with FoamWerks Straight Cutter and V-Groove Cutter. The WC style blade fits the Straight Cutter, Straight/Bevel Cutter, Rabbet Cutter, and V-Groove Cutter. The WA blade fits the Circle Cutter. The WB blade fits theFreestyle Cutter, and WD drill tips fit the Hole Drill. Want to try out some projects? Click on the images for the pdf instructions.